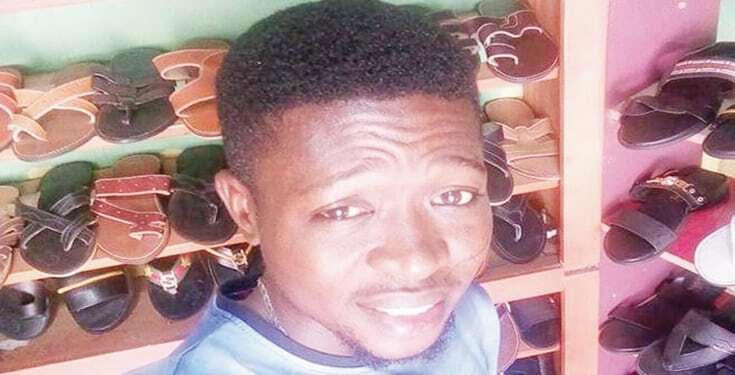 The family of Olaitan Balogun has been thrown into mourning after he was allegedly beaten to death by his friend, Olumuyiwa Ajibade, at his place of residence, No 1 Donald Estate, in the Ajuwon area of Akute, Ogun State. It was gathered that trouble started after Ajibade had a misunderstanding with his live-in lover, Titi, and reportedly abandoned her for some months at his place of residence, which is close to Balogun’s shop, but because she usually visited the deceased’s shop to charge her phone whenever there was power outage, a security man in the estate, Kazeem, reportedly informed Ajibade that they were having an affair. When Ajibade, who had accused Balogun of having a secret affair with Titi, found out that he was in his lover’s apartment on Friday, March 15, 2019, he and his friends allegedly pounced on the deceased, stripped him naked and beat him to stupor. Footage of the incident obtained by PUNCH Metro showed the victim stripped naked and almost inaudibly pleading for his life. The deceased’s aunt, Bosede Olusola, said Balogun’s secret lover, Omolara Lawal, had visited him on the day of the incident, but when it was getting late, the cobbler was said to have sought Titi’s consent to allow Omolara to pass the night at her place. She said Balogun was on his way out of the estate, after taking Omolara to Titi’s apartment, when Ajibade and his friends allegedly pounced on him without giving him the opportunity to explain himself. The businesswoman said, “Ajibade and Titi had a misunderstanding and he rented an apartment for her at No 1 Donald Estate, Ajuwon, Akute, as part of the settlement terms. The house is very close to Balogun’s shop. “So, on the day of the incident, Balogun’s secret lover, Omolara, had visited and they went out in the night. When it was late for her to go home, Balogun sought Titi’s consent to allow Omolara to pass the night in her place. “Unknown to Balogun, one of the security men in the estate, Kazeem, had been informing Ajibade that he was having an affair with his live-in lover. So, on that faithful night, Ajibade was informed that Balogun was in the apartment he rented for Titi and immediately he and his friends rushed down and met the victim on his way out of the estate and they began beating him. “They stripped him naked, dragged him on the floor to the house and even injected him with an unknown substance. They never gave him a chance to explain that he took Omolara there so that she could pass the night. Balogun’s wife, Modupeola, while demanding justice for his death, said when she visited the Tamara Hospital to check on him, the doctor, who attended to him, said he died of internal bleeding. The 34-year-old mother of three said, “The last time I saw him alive was when he left for his workshop on Friday, but I was at home when his apprentice, Chidi, suddenly came home to inform me that someone had beaten my husband and that he had been rushed to hospital. Balogun’s younger sister, Ifeoluwa Ojo, said his corpse was transferred to the Life Channel Mortuary after he gave up the ghost. The state Police Public Relations Officer, Abimbola Oyeyemi, said that the command had arrested Ajibade for allegedly beating Balogun to death after meeting him at his place of residence around midnight. Oyeyemi also said that Ajibade had alleged that Balogun was having an affair with Titi, but when the lady was interrogated, she denied the allegation. The PPRO added that the State Commissioner of Police, Ahmed Iliyasu, had ordered the immediate transfer of the case to the Homicide Section of the State Criminal Investigation and Intelligence Department for discreet investigation and prosecution of the suspect. Oyeyemi said the suspect would soon be charged to court after the completion of investigation.